Changing lives for brighter futures one thought at a time. 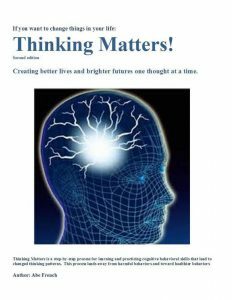 Enroll Participants in a Thinking Matters training session. People often wish they could change unproductive behaviors into something more rewarding and satisfying. Unfortunately, many of us think it takes sheer will power and determination. This can be true. But, it is not the most productive way to create lasting change in ourselves. Will power can weaken over time. success seems distant when this happens. When we get discouraged it is easy to fall back into unproductive thinking and destructive behaviors. This is why Thinking Matters approaches self-change with a set of skills that can be learned and practiced relatively easily. It is difficult to maintain changes in ones behavior if there is no understanding of the specific thinking that leads to a particular behavior. Thinking Matters helps folks practice looking at their own thinking, determine what part leads toward trouble and choose to use alternative thinking. These skills help to develop a healthy self curiosity that becomes more comfortable as they are practiced. Many times the “trouble” with our behaviors is not readily apparent to us. It is usually a matters of how our behaviors reflect upon us, shape others viewpoint and/or are in conflict with rules/laws or create inconvenience/problems for the people around us. It often seems as if folks should make adjustments in how they do things because they are being unreasonable. Thinking Matters helps people become more aware of the themes in our thinking. If a person gains an awareness that they regularly blame others and see their associates as “wrong” they can begin to question their own way of viewing the world around them. Sometimes others are wrong. But, is almost everyone wrong so often is deserves to be a theme in our thinking habits? Thinking Matters provides a skills based 5 step process for evaluating and changing our thinking habits. Thinking Matters | Powered by Mantra & WordPress.